Career Builder was developed as a cost effective, but comprehensive, integrated and holistic career development tool to help students identify their strengths and preferences and make well considered further study, career and lifestyle decisions. The site/network version enables large numbers of student users to access the program at the same time. Group feedback is facilitated by the provision of a Career Exploration Guide and Workbook (reproducible masters supplied with the program). Career Builder identifies likely "at risk" students/clients who may need extra help due to personal circumstances or preference inconsistencies. How does Career Builder work? 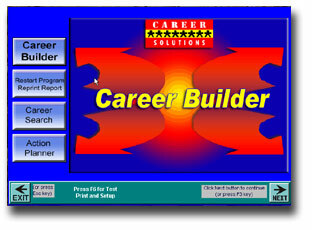 Career Builder is an integrated and easy-to-use computer assisted career exploration and planning process. The program automatically activates different exploration pathways in response to different ages and personal circumstances. Self understanding is enhanced through analysis of education, work history, skills, interests, values, aspirations, personal circumstances, and external influences. Personal strengths and preferences are automatically linked to likely compatible career options. Likely compatible Industries, Career Clusters and Occupations, Occupation Specialisations and Career Combination are explored to facilitate well informed decision making. A detailed but easy-to-read report is generated, which provides immediate feedback. The report outlines the findings of the self understanding, career exploration and career decision making processes. The report also notes any inconsistencies between personal strengths and preferences, and career option preferences. The Action Plan pro-forma at the end of the report can be used to facilitate the planning of action steps needed to achieve the client's career goals, or more detailed action planning can be completed using the Action Planner program, which comes with Career Builder. While individual follow-up counselling is recommended, group feedback and peer career coaching sessions can also be effective. The manual includes support materials for the various methods of providing feedback. The report also provides a very useful focus for career planning discussions with family and important others. Easy and time efficient - takes approximately 40 minutes for individuals or groups to complete, and can be continued on another day if required, as it saves as it goes. Comprehensive and fully integrated analysis and reporting. Improves self awareness and clarifies personal and career goals. Encourages self empowerment and student/client responsibility for their own career planning. Identifies likely "at risk" students/clients who may need extra help due to personal circumstances or preference inconsistencies. Explores likely compatible Industries, Career Clusters, Occupations, Occupation Specialisations and Career Combination themes. The database includes over 3,500 career options, which cover all educational/ occupation levels. A comprehensive and easy-to-follow Report and Action Plan pro-forma is automatically generated (and a summary report for the career professional - which can be turned off if not required). Detailed action planning can be completed using the Action Planner program supplied with Career Builder. Action Planner is also a useful tool for student/client follow-up and progress monitoring. A site/network copy of Career Builder is recommended when large numbers of students/clients need help with subject, course, work experience and other career choices. A reproducible workbook is supplied to assist with group career development facilitation. Overhead masters and a powerpoint display are provided for use at parents and friends nights. COMPREHENSIVE CAREER EXPLORATION - The database includes over 3,500 Industries, Career Clusters, Occupations and Occupation Specialisations covering all educational/occupational levels. Career Combinations are explored, as well as career dreams. Career Combinations often generate the student's/client's most satisfying career options. ANNUAL UPDATES - The database, program and support materials are updated annually to ensure that your students/clients use only the most recent career exploration resources. SELF EMPOWERMENT - encourages students/clients to take responsibility for their own career decision making and planning. Students/clients learn the skills needed to make well considered career decisions, to set goals, and to plan action steps designed to achieve their goals. Contingency plans and time lines are explored, as well as ways of facilitating planned happenstance. The Action Planner program supplied with Career Builder facilitates detailed action planning and tracking of student/client progress. DECISION MAKING - Students/clients proceed through a unique process of broadening and refining their self understanding and career options to arrive at well considered career and life decisions. Career dreams, possible career combinations and ways of overcoming barriers to career goal attainment are also explored. FEEDBACK - is immediate, with attractive and comprehensive student/client reports and action plans, and summary reports for the career professional. MULTIPLE PATHWAYS - The program automatically follows different pathways, depending on age and personal circumstances (Years 8 - 12, school leavers and adults). MANUAL - The comprehensive manual includes one-on-one career counselling notes, reproducible masters of the workbook and career exploration guide, and overhead projection transparency masters (now on CD). THE WORKBOOK - is included to facilitate group career development sessions. It is provided as loose sheets, so that the careers adviser can select those required. REPORT WRITER - Enables career advisors and career counsellors to easily and quickly produce reports of program usage and student/ client preference patterns for course/training planning, research, evaluation and follow-up purposes. ACTION PLANNER - BONUS This advanced and integrated goal setting and action planning software is supplied with Career Builder. It includes goals, action planning steps (tasks), resources, barriers, contingency plans, achievement recording, and progress tracking and follow-up. Action Plans and chronological To-Do-Lists are produced. Click below to see examples of the report generated at the end of the Career Builder session (requires Adobe Acrobat Reader). The software is customised with the school's/organisation's name appearing on the program screens and on the report. School/organisation specific information, such as the names and contact details of career personnel, career functions, dates can be included at the end of the report and regularly updated by the careers adviser. To assist students with subject choice, the software is supplied with State specific (for Australia) Year 11 and 12 subjects, and country specific subjects for other countries. The list of subjects can be edited using the SETUP program supplied to reflect the subjects offered in a particular school. CAREER SOLUTIONS single licence software can only be used on one computer at a time, but the software can be removed and installed on another computer at the same site. CAREER SOLUTIONS network/site licence software can be loaded onto a single site network and/or onto any number of stand alone computers at the one site.